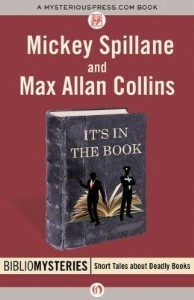 Max Allan Collins and Ellen Hart have been chosen as the 2017 Grand Masters by Mystery Writers of America (MWA). MWA's Grand Master Award represents the pinnacle of achievement in mystery writing and was established to acknowledge important contributions to this genre, as well as for a body of work that is both significant and of consistent high quality. Mr. Collins and Ms. Hart will receive their awards at the 71st Annual Edgar Awards Banquet, which will be held at the Grand Hyatt Hotel in New York City on Thursday, April 27, 2017. 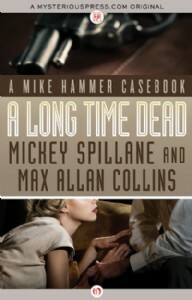 We're proud to publish two Mike Hammer books by Collins—A Long Time Dead: A Mike Hammer Casebook and It's in the Book: A Bibliomystery. Click the covers below to find them! By the way, A Long Time Dead is also available in a limited hardcover edition, signed by Collins and Jane Spillane (Mickey Spillane's widow), published by the Mysterious Bookshop! There are also still a few copies of numbered or lettered hardcover editions of the duo's Bibliomystery, available here.